Meeting at local pubs and gigs for their respective bands, band members Josh Battersby (guitar), Hugh Black (drums), Brian Bolado (percussion), Ray Dalfsen (vocals, guitar), Tom Gordon (guitar), Josh Healey (guitar) and Nick Horvat (bass) assembled within an unassuming rehearsal space amongst the industrial haze of Thebarton suburbia. 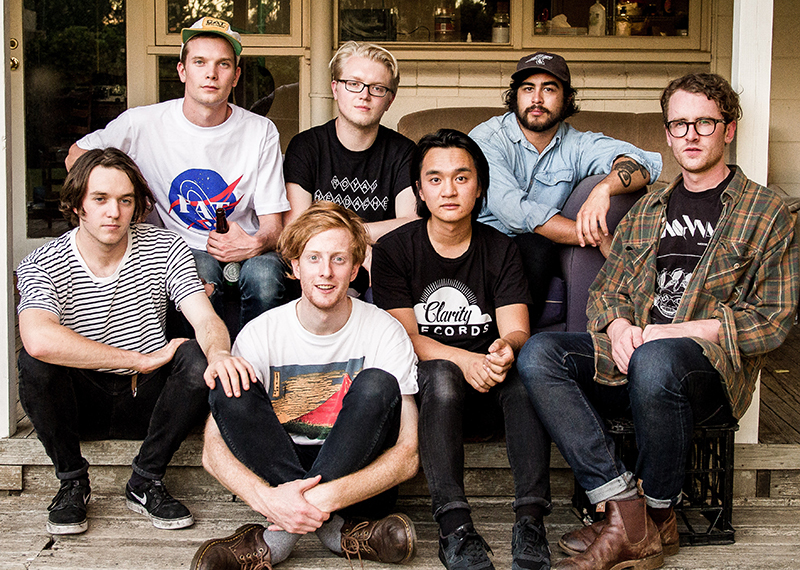 The thrashy guitars and smoky lyricism have seen the Adelaide seven-piece share stages with international acts Wavves and Cloud Nothings, as well as local favourites Courtney Barnett and King Gizzard & The Lizard Wizard. After releasing their debut 10” EP through Mirador Records and touring with Bad//Dreems in 2015, West Thebarton Brothel Party are continuing to turn heads across the country having been highlighted in the triple J Unearthed forecast for ‘The Ones to Watch in 2016’ and Rip It Up’s ‘The Hot Six of 2016’. Within the opening months of the new year, West Thebarton Brothel Party were selected to perform at the Oakbank leg of Groovin The Moo and Noisey/Jack Daniels Future Legends’ ‘The Next On Tour’. The band went on to premiere its first single ‘Red or White’ through Home & Hosed on triple j and were chosen as ‘Unearthed Feature Artist of the Week’ after receiving spot rotation on the national radio broadcaster. West Thebarton Brothel Party don’t just want you to hear their music, they want you to feel it too.